The Tarot Familiars deck, which was released last year, boasts beautiful and mystical artwork that speaks to the animal lovers. It has some other great features, however, it does fall short in two areas. Three Major Arcana cards from the Tarot Familiars. I’ve always loved decks that strongly feature animals – in fact, my very first deck was the The Druid Animal Oracle. Another one of my favorites, The Wildwood Tarot, utilizes bears, birds, deer, and other animals along with the people in the deck. 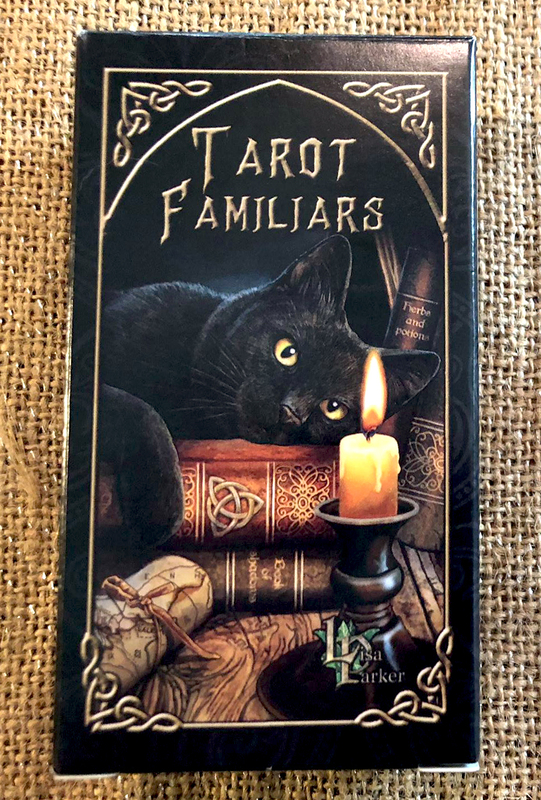 Several other decks that I frequently read with include animals, so it was no shock that the Tarot Familiars by Lisa Parker would catch my eye while visiting a favorite New Age and Witchy store. I hesitated to buy it because this deck really does have a couple shortfalls, but when I pretty much saw my own cat in the seat of the Queen of Wands, I was sold. First of all, most of the cards are beautiful and charming. The style is fairly realistic, but with a touch of magical fantasy. I understand Parker was first a wildlife artist and it shows. Instead of stylistic or simplified animals, we have beautiful and accurately drawn ones – though they have been given a polish of perfection that gives it a fantastic feel. 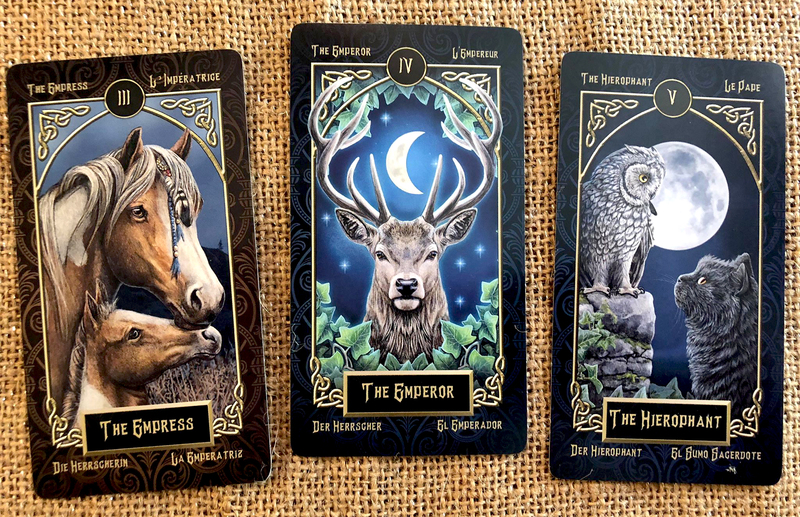 The deck features a variety of animals, such as cats, owls, ravens, wolves, hares, deer, and horses. 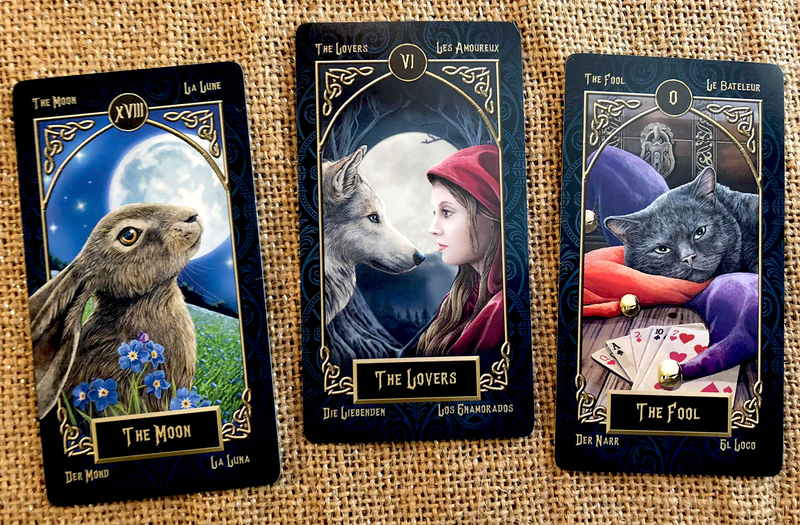 Three beautiful key cards from the Tarot Familiars, including an interesting choice for The Lovers. 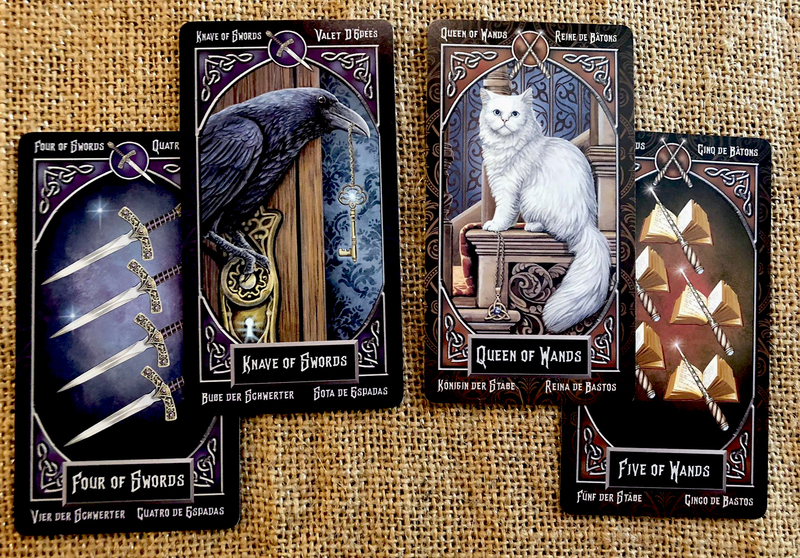 As already mentioned, I was hooked after seeing the Queen of Wands (shown in one of the Court and Pip card sets below) as it so closely resembled my cat Gabriel, who is the animal I consider to be my familiar, in her prime. If the image had shown one yellow eye and one blue, it would have been perfect. The first card I pulled when using the deck looked very much like my friend’s cat. It’s likely that most of us would know an animal that looks like one in the deck, which will only help people to connect with it. Speaking of connection, being a deck about familiars should be popular among many readers I know. 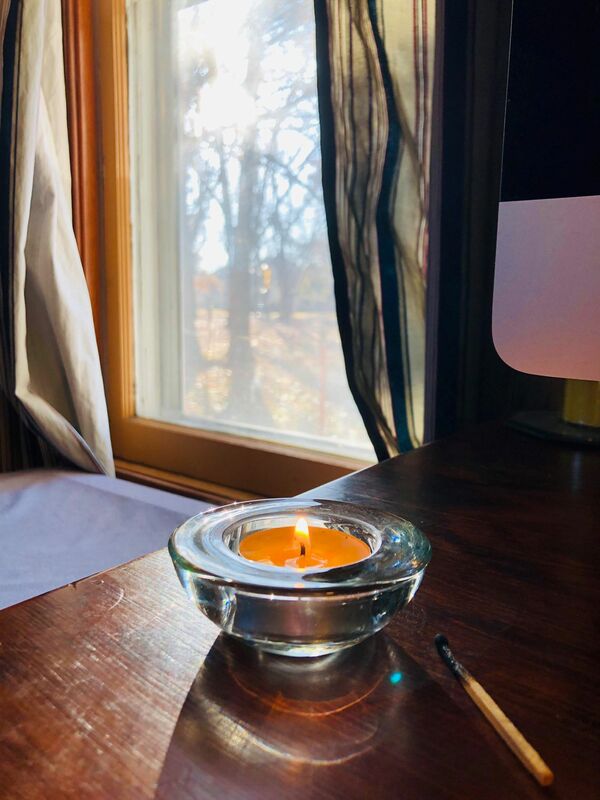 Most of us feel a strong connection to at least one animal, and have felt that animal was a part of our spiritual and magical journey. Even those who consider these creatures to be totems or power animals would probably enjoy it. There are some interesting images presented, such as Red Riding Hood and the Wolf as The Lovers, but I found some of these to be more intriguing than off putting. The Tarot Familiars has a perfect size for handling. There are also many little details and symbols in the cards. The road sign saying “Pendle” (a reference to the Pendle Hill witches of history), keys, triskeles, moons, meaningful plants, and more all are there for those with an eye for detail. Sometimes less is more and that’s true here. This is much smaller deck than a lot of those coming out, but it’s a good thing. Even with my long hands, many decks are difficult to hold and shuffle. Not this one; it’s ideal. The cards were a bit slick when I shuffled, but I expect that to lessen as the deck is used more. The last benefit I’m mentioning is that the cards are multilingual. I’ve seen a few decks like this, but most seem to just have one language and might have different editions for other languages. This one has English, Spanish, French, and German on each card – English is in the center as well as the upper left corner, but the other three corners use the other languages. It’s a little thing, but I enjoy seeing if I can remember Spanish well enough to guess the card’s Spanish name. 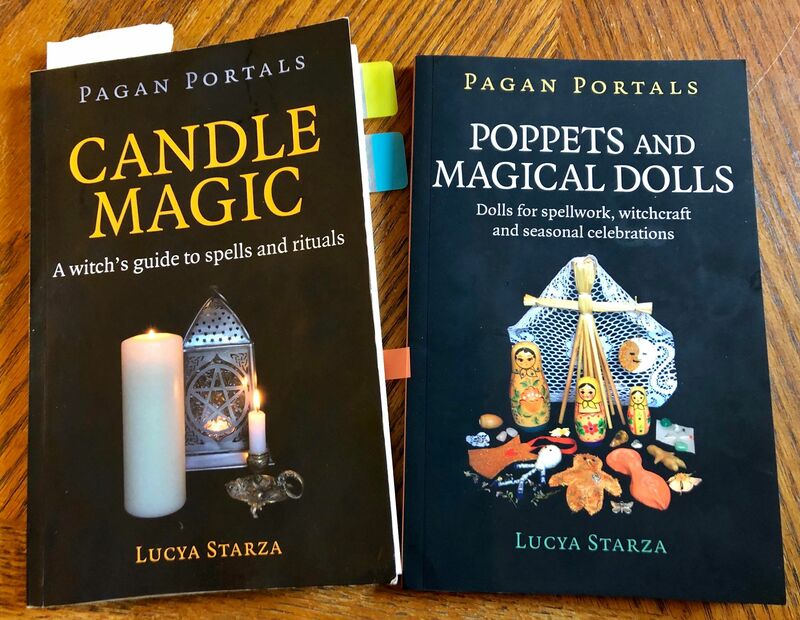 The included booklet also explains the meanings in all four languages. Nothing is perfect, and this deck is no different. Though I have to say the biggest thing that irritated me about it was the Pip cards, or the number cards of the minor arcana. As some of you have guessed, the artist did not create individual artwork for these cards. 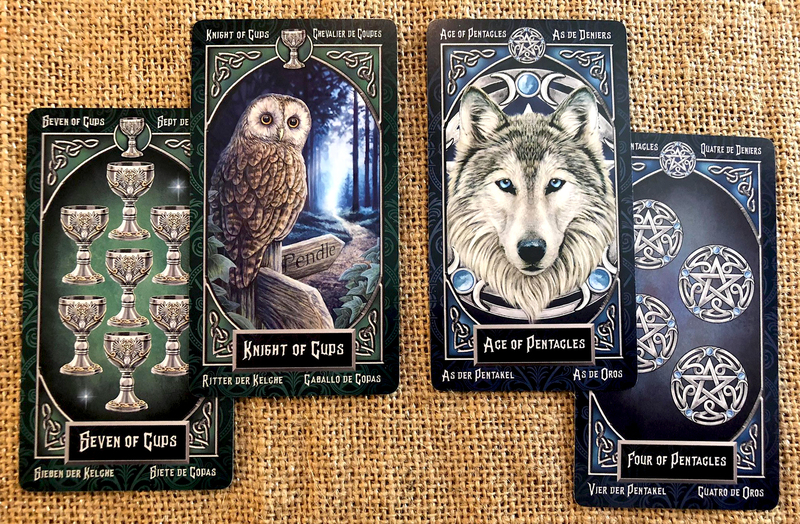 Instead, we have well drawn swords, wands, pentacles, and cups that are repeated the number of times needed for the card. Below I’ve included a Court card and a Pip card from each suit. The Court cards are stunning, but the Pip cards lack individuality. I cannot express how disappointing this is to me. 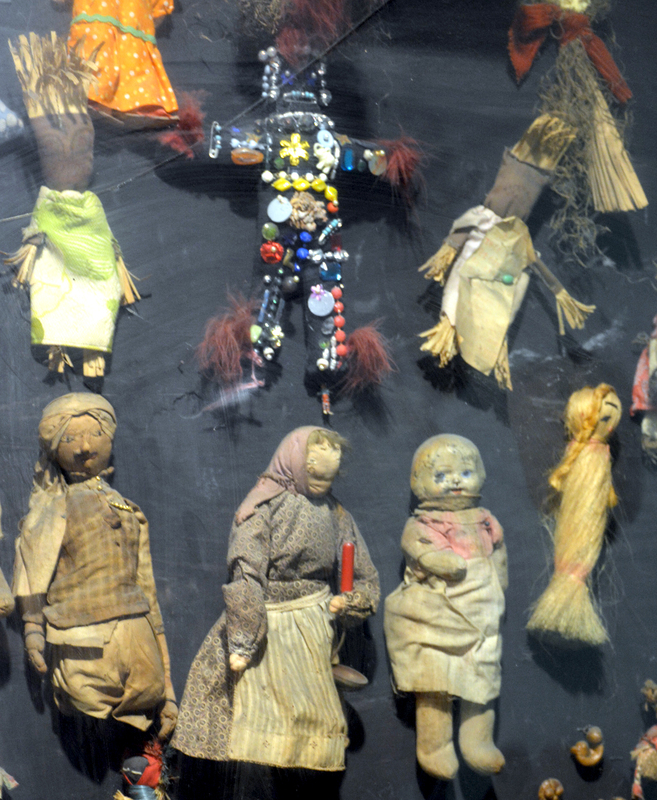 I fully realize that many Tarot readers know exactly what each card represents, regardless of the art. I am not one of these readers. I intuit much from the artwork and don’t ever buy a deck if I don’t connect with the art. This deck was a questionable decision for me because these cards are not given the attention that the Major Arcana and the Court and Ace cards were given. 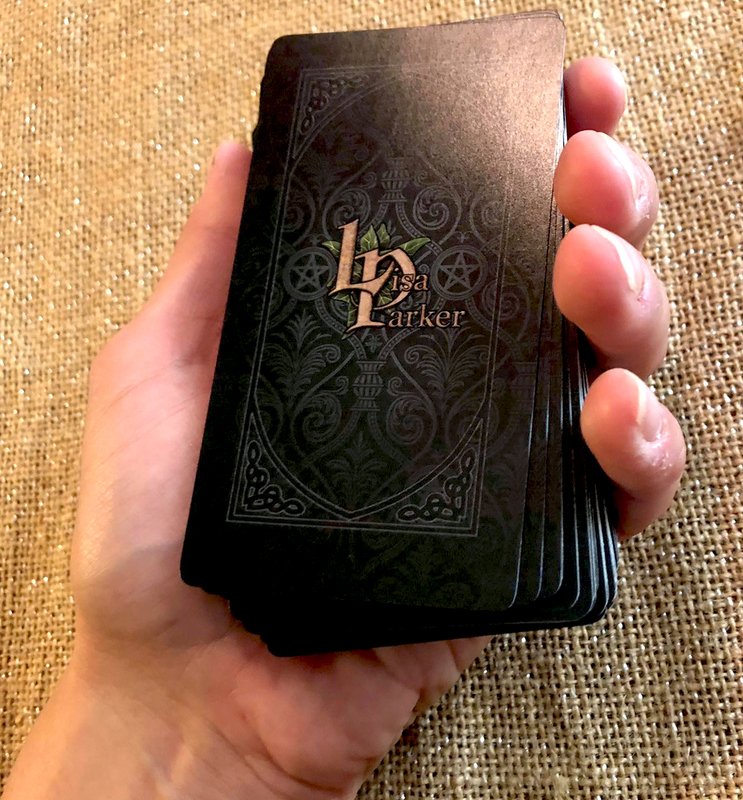 Personally, I hope a later edition corrects this issue – a lot of Tarot deck collectors consider this a lazy move and I suspect it will impact the sales and love given the deck. For me, I’m considering removing the pip cards and using this more as an oracle deck. While some would bemoan this idea, it could actually work for me because I do take so much from the artwork and not the official meanings. It would still have 42 cards, which is plenty for an oracle. The other thing that’s a bit lacking is the booklet. Again, experienced Tarot readers will be fine. However, newer readers may wish there was a bit more than the couple sentences that each card is given. If you are an experienced Tarot fan and love the art and animal connection, go get this deck! If you’re like me who connects to each card’s artwork, it’s something to carefully consider when you think of the number of other decks out there. The cards are gorgeous but there are tradeoffs. If you enjoy animal-based decks, keep an eye out here for future reviews. On the same trip when I bought this deck, my boyfriend picked up this spring’s release, The Wild Unknown Animal Spirit deck. He’s agreed to share, so I might review that one too. The upcoming The Spirit Animal Oracle by College Baron Reid is one I’m considering when it comes out in October.